So I'm sitting at the collection tables after a day of fungus hunting, surrounded by mushrooms, microscopes, keys, drying equipment, and mycologists. One mycologist pokes around in another mycologist's collection basket, inspecting, then holds up a little brown mushroom. "You brought in an Inocybe? Why?" No one cares about Inocybes. 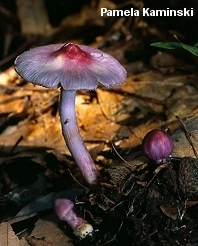 With a few purple exceptions, they epitomize the label LBM (Little Brown Mushroom), and are characterized by their brown spore prints, their often conical and usually silky-to-hairy-to-scaly or lacerated caps, and their frequently characteristic odors. There are hundreds of them, and probably hundreds of undocumented, "cryptic" species. In fact Inocybe is often treated less as a genus of mycorrhizal mushrooms than as a mycological rite of passage; if you have not "put a name on" a few Inocybes at some point in your life, good luck getting your (Myco-) Country Club membership. To me, all of this suggests that Inocybe is a prime candidate for demystification. Using a microscope isn't that hard, for crying out loud--and acquiring obscure mycological literature is a relatively simple matter of Interlibrary Loan, even from your public library. So let's grab our pitchforks and headed for the gated community known as Inocybe Heights. The key below has been under development since 2005; it covers the species that demonstrate purplish shades (anywhere on the mushroom), and the white species (added in 2007). Yes, I am delaying the hard ones with brown and yellowish caps. If you absolutely cannot wait to identify your little brown or yellow Inocybe (it may be several years until I finish the key--and by then some enterprising molecular biologist may well have determined that many or most of the current morphology-defined species are invalid), a list of technical and semi-technical Inocybe sources can be found at the bottom of the page. The concept of Inocybe has held up amazingly well under DNA scrutiny, which has even supported many of the traditional divisions within the genus (subgenera, sections, and so on). There are some exceptions, of course, but the overall picture, originally painted on the two-dimensional canvas of morphology (physical features as determined with and without a microscope), has been given depth by DNA studies and is beginning to become a three-dimensional sculpture. Since the mushrooms are mycorrhizal, they have obviously evolved in close association with their symbiotic tree partners. While mycologists have not traditionally paid much attention to the documentation of mycorrhizal associations (the paper listed below by Cathy Cripps on "[t]he genus Inocybe in Montana aspen stands"  is a notable exception), it may be the case that this kind of information will help to further elucidate speciation and evolution in Inocybe. Unlike most keys at MushroomExpert.Com, this key is frequently microscope-based. There is just no escaping the need for microscopic analysis with Inocybe. Source abbreviations refer to the references list below the key. 1. Lilac or purplish shades present somewhere on the mushroom. 1. Lilac or purplish shades absent. 2. Spores with nodules, warts, or spiny structures. 2. Spores not as above. 3. Cystidia absent from gill faces. 3. Cystidia present on gill faces. 5. Mature cap to 1 cm across, reddish brown; spores 8-10 µ long. 5. Mature cap larger than above, variously colored; spores shorter than above. 6. Cystidia with thin walls; cap pinkish brown but fading markedly as it dries out (hygrophanous). 6. Cystidia with thick walls; cap whitish over the center, pale purplish gray elsewhere. 7. Cystidia absent from gill faces. 7. Cystidia present on gill faces. 8. Cap with a dark purplish brown central bump, purplish brown elsewhere; gills and stem discoloring pinkish. 8. Cap with a whitish or pale central bump, whitish to pale greenish or pinkish elsewhere; neither gills nor stem discoloring pinkish. 9. Cap with lilac shades. 9. Cap without lilac shades. 10. Cap lilac to grayish lilac, fading to whitish; cystidia 40-60 µ long, fusoid-ventricose, with encrustations. 10. Cap brownish, sometimes with lilac hues; cystidia 50-80 µ long, almost capitate (with swollen ends), without encrustations. 11. Cystidia with thin walls; stem with a grayish sheath and a purplish apex; cap grayish. 11. Cystidia with thick walls; stem variously colored but not sheathed; cap variously colored. 12. Stem with conspicuously contrasting brown or rusty red hairs. 12. Stem without hairs, or with pale hairs that do not contrast conspicuously. 13. Cap rusty red; spores 7-10 µ long; cystidia 60-80 µ long. 13. Cap brown; spores 9-11 µ long; cystidia 60-100 µ long. 14. Cap creamy yellow to creamy buff, sometimes with a pale cinnamon center. 15. Most spores with length in the range 10-16 µ. 15. Most spores with length in the range 7-11 µ. 16. Cap maroon becoming brownish; flesh with a pinkish tinge; cheilocystidia projecting prominently. 16. Cap brown to dark brown, becoming tawny; flesh not pinkish; cheilocystidia not projecting prominently. 17. Cap with a reddish brown center, pale brown elsewhere; cystidia 63 µ long or shorter; odor distinctive but not spermatic. 17. Cap otherwise colored; some cystidia regularly longer than 63 µ; odor spermatic (or not recorded). 18. "Gregarious or subcaespitose, 4-4.5 cm high; cap pale ochraceous-fulvous, convex then expanded, nearly gibbous, prominently squamulose and irregularly rimose, marginally smoothly radiating-rimulose, 2-2.5 cm wide; gills broadly sinuate-adnexed, ventricose, isabelline becoming rusty-fulvous; cystidia cylindric or ventricose, thick-walled, 50-70 x 10-16 µ; spores oval or subreniform, inequilateral, smooth, 8-10 x 5-6 µ; stem 4-5 mm thick, white below, violaceous above, minutely white-velutinous, not squamose, with a basal bulb whose membranous volva sometimes becomes free; flesh white above, violaceous below" (Atkinson, 1918; my translation from Latin, my emphasis). 18. Not completely as above. 19. Cystidia with apical, cystalized encrustations; stem base slightly enlarged. 19. Cystidia without crystalized encrustations; stem base not enlarged. 20. Fresh, unfaded cap white, whitish, or slightly pinkish. 21. Cap with pinkish hues, and/or surfaces and flesh staining pinkish to reddish. 21. Cap not pinkish; pinkish to reddish staining absent. 22. 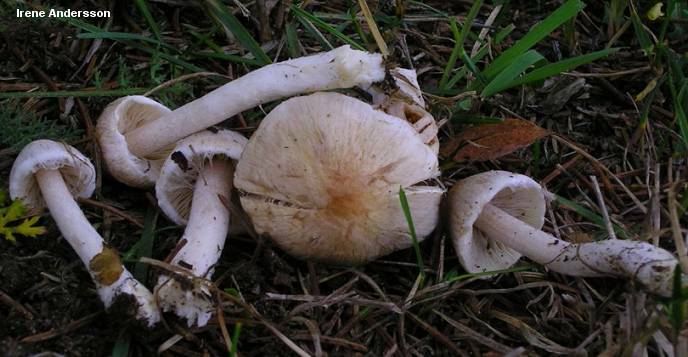 Cap (and sometimes the stem) with pinkish coloration rather than pinkish staining or bruising; gills and flesh not staining pinkish; spores 10-12.5 x 5.5-6.5 µ, not nodulose, warty, or spiny; originally described under spruce and hemlock in Nova Scotia. 22. Pinkish to reddish hues on surfaces and flesh resulting from staining or bruising; spores variously sized and shaped; ecology and range various. 24. Odor strong, sweet, and fragrant (like the odor of Tricholoma magnivelare). 25. Spores nodulose or angular. 25. Spores not as above. 26. Cap 4-10 cm; in North America growing in low, wet, hardwood-based ecosystems. 26. Cap substantially smaller than above; in various ecosystems. 27. Cap .5-3 cm across. 27. Cap 2-5 cm across. 28. Stem terminating in a marginate bulb; cap 1-3.5 cm across; fairly well documented; probably widely distributed in North America. 28. Stem not terminating in a marginate bulb; cap .5-2 cm across; poorly documented; known from New York. 29. Stem hollow, not terminating in a marginate bulb; odor not recorded. 29. Stem not hollow, terminating in a marginate bulb; odor sweet. 30. 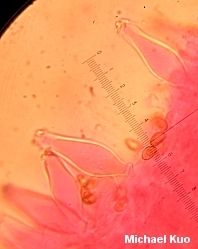 Pleurocystidia absent; spores (9) 11-14 µ long. 30. Pleurocystidia present; spore length various. 31. Cap tiny (4-8 mm across); growing from decaying wood. 31. Cap larger than above; terrestrial. 32. Most spores over 10 µ long. 32. Most spores shorter than 10 µ. 33. Cap silky, or with a slightly fibrillose margin--becoming slightly fibrillose with maturity. 34. Cap 1.5-4 cm across. 34. Cap 3-6 cm across. 35. Pleurocystidia 54-72 µ long; widely distributed; common; well documented species. 35. Pleurocystidia under 50 µ long; ranges apparently limited to northeastern North America; not common; documentation sparse. 36. Stem 4-6 mm thick, equal, not hollow; buttons with a "profuse" cortina; odor not recorded; recorded from New York (possibly only by the type collection). 36. Stem 2-4 mm thick, with a basal bulb, usually hollow; cortina not mentioned by Grund & Stuntz; odor spermatic; recorded from Nova Scotia. 37. Pleurocystidia under 55 µ long; stem 4-8 cm long. 37. Pleurocystidia longer than 55 µ; stem 2.5-6 cm long. Abbreviations correspond to those in the key above. [A] Arora, D. (1986). Mushrooms demystified: A comprehensive guide to the fleshy fungi. Berkeley: Ten Speed Press. 959 pp. [ATK] Atkinson, G. F. (1918). Some new species of Inocybe. American Journal of Botany 5: 210-218. [C] Cripps, C. L. (1997). The genus Inocybe in Montana aspen stands. Mycologia 89: 670-688. [GS1] Grund, D. W. & Stuntz, D. E. (1968). Nova Scotian Inocybes. I. Mycologia 60: 406-425. [GS2] Grund, D. W. & Stuntz, D. E. (1970). Nova Scotian Inocybes. II. Mycologia 62: 925-939. [GS3] Grund, D. W. & Stuntz, D. E. (1975). Nova Scotian Inocybes. III. Mycologia 67: 19-31. [GS4] Grund, D. W. & Stuntz, D. E. (1977). Nova Scotian Inocybes. IV. Mycologia 69: 392-408. [GS5] Grund, D. W. & Stuntz, D. E. (1980). Nova Scotian Inocybes. V. Mycologia 72: 670-688. [GS6] Grund, D. W. & Stuntz, D. E. (1981). Nova Scotian Inocybes. VI. Mycologia 73: 655-674. [GS7] Grund, D. W. & Stuntz, D. E. (1983). Nova Scotian Inocybes. VII. Mycologia 75: 257-270. [GS8] Grund, D. W. & Stuntz, D. E. (1984). Nova Scotian Inocybes. VIII. Mycologia 76: 733-740. Hansen, L. & Knudsen, H., eds. (1992). Nordic macromycetes Vol. 2: Polyporales, Boletales, Agaricales, Russulales. Copenhagen: Nordsvamp. 474 pp. Jacobsson, S. (2008). Inocybe (Fr.) Fr. in Knudsen, H. & J. Vesterholt, eds. Funga Nordica: Agaricoid, boletoid and cyphelloid genera. Copenhagen: Nordsvamp. 868-906. Kauffman, C. H. (1920). Studies in the genus Inocybe. The species of Inocybe in Peck's collections. Bulletin of the New York State Museum 233-234: 43-60. [K2] Kauffman, C. H. (1924). Inocybe. North American Flora 10: 227-260. [MK] Matheny, P. B. & Kropp, B. R. (2001). A revision of the Inocybe lanuginosa group and allied species in North America. Sydowia 53: 93-139. Matheny, P. B., Liu, Y. J., Ammirati, J. F. & Hall, B. D. (2002). Using RPB1 sequences to improve phylogenetic inference among mushrooms (Inocybe, Agaricales). American Journal of Botany 89: 688-698. Matheny, P. B. (2005). Improving phylogenetic inference of mushrooms with RPB1 and RPB2 nucleotide sequences (Inocybe; Agaricales). Molecular Phylogenetics and Evolution 35: 1-20. Nishida, F. H. (1989). 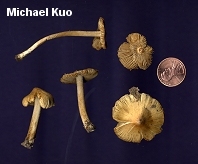 Key to the species of Inocybe in California. Mycotaxon 34: 191-196. [SS] Smith, A. H. & Stuntz, D. E. (1950). New or noteworthy fungi from Mt. Rainier National Park. Mycologia 42: 80-134. [SSW] Smith, A. H., Smith, H. V. & Weber, N. S. (1979). How to know the gilled mushrooms. Dubuque, Iowa: Wm. C. Brown. 334 pp. [S47] Stuntz, D. E. (1947). Studies in the genus Inocybe I. New and noteworthy species from Washington. Mycologia 39: 21-55. Stuntz, D. E. (1954). Studies in the genus Inocybe II. New and noteworthy species from Michigan. Papers of the Michigan Academy of Science, Arts, and Letters 21: 163-197.